A mobile inspires a child’s dream of flying in a rocket. Vibrant cover art depicts a child peering through a round window. The same child is then shown tucked into bed beneath a mobile with stars, planets and a rocket with round windows; attentive readers will recognize this decoration from front endpapers. Ensuing pages show the child traveling through space in the rocket and eventually zipping around an earthly environment, too. 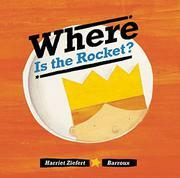 Meanwhile, Ziefert’s text invites speculation by posing questions like “Where are we going?” and “Are we there yet?” This participatory approach is heightened when pictures use the book’s physicality to elucidate text—for example, “up…and on the left” is accompanied by a picture of the rocket moving upward. The text then employs direct address to ask, “What’s on your left?” Ultimately, dreamscapes recede to reiterate the image of the child in bed and the rocket dangling from the mobile. A concluding page of text resounds, “HERE!” heralding the return and then shifts to a closing interrogative stance, inviting readers to respond to questions like “What’s to your right? What’s to your left?” There’s an inverted echo of Goodnight Moon here, with the text resisting naming things in its realm and instead asking child readers to name things in theirs.